"Building Green" homes is as old as building dwellings, and yet it is finally coming into its own as a movement of necessity. We must correct the current imbalance before sustainable building can become the norm. We think building green manufactured, or “modular” homes is important in correcting this imbalance. As Contributing Members of the local Green Building Institute we actively network and collaborate for constant company and self-improvement. Every home is different; yours will be the beneficiary of the growing body of experience within our industry, and at Finish Werks. On our High Performance Homes and Additions page, find out the key components of a green modular home and what your options are as a homeowner. Make your home perform at its best in terms of energy, water, and resource efficiency. Know that you are making a JUSTIFIED decision when you invest in “green” manufactured home building – justified by the improvements in your health and comfort, the health of our planet, and quantifiable financial returns ($$$). However, Finish Werks is not just here to help you make a “green” investment with your next modular or stick-built home or addition. We are green home builders, but we have also compiled information that we feel is a must-read for the Green DIY'er whether you’re building a home or not. There are lots of simple ways for a homeowner to go green without the help of expensive outside sources. Here’s the top 10 easiest ways to green your home, courtesy of Ann Archer of MSN Real Estate. For full explanations, visit our "Green Your Home" page. We’ve got one more to add to the list – properly recycle batteries and fluorescent light bulbs. We’ll even help you out with this! Drop by our office with all your old batteries and fluorescent bulbs, and together we will keep them out of our local landfills, waterways, and ultimately our loved-ones' bodies. If you are still craving more on “green,” check out our library of EnergyEfficient and Green PDFs, on our Media & Downloads page. From here on down, you will find even more resources on green home building, whether manufactured/modular or stick-built, including an excerpt from Green From the Ground Up, a book on common-sense solutions for creating homes that are self-reliant, resilient, and versatile. At the very bottom of the page, a complete list of industry resources, from associations and organizations to consultants and publications, details the websites and contact information for each. "Green building is a wide-ranging, complex topic, and 'green' is one of the key buzzwords in the building field today. Contributing editor Scott Gibson takes a look at the complicated definition of what building green means now. 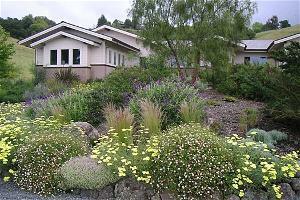 "A big variety of local and regional programs make green building hard to standardize, but green has some key goals, including a tight building envelope, low energy consumption, minimal site disturbance, water conservation, solar orientation, water and energy efficiency, the use of recycled materials*, and healthful indoor-air quality. "Gibson also discusses the U.S. Green Building Council's Leadership in Energy and Environmental Design (LEED) program, which requires third-party verification for a building to achieve green status. The article 'What Does Green Really Mean?' [click for PDF] includes five case studies for houses in a variety of locations (such as urban, rural, mountain) and highlights the qualities that make each house green." seven out of 10 home buyers are either more or much more likely to buy a "green" home in a down housing market. By: Charles Redell - 7.25.08 © Sustainable Media Inc.
Common-sense solutions for creating homes that are self-reliant, resilient, and versatile. There is no such thing as the perfect green home. Every house is unique. Each is built in a specific climate where there are varying amounts of sunshine; winds blow from a different direction by season and each site affords different views. Local building products are available or not, there will be small children in the home, or not. And so forth. There is no single green building solution that meets all possible conditions. The best way to start is to take on some aspect of green building and get really good at it. Don’t try to do everything at once. Take on energy conservation and increased R-values in walls and roofs. Get a blower door test done on one of your homes. Try changing the paints and finishes you have always used. Test materials in your garage or on your own home. See what works best for you and your trade contractors. Identify the resistance points in your company or with your trades. Education is the top priority any time you are making changes in your business. Let them know why you are making the changes. At the same time, there are certain inevitabilities that will affect all of us. Climate change will bring about increasingly weird weather. Floods and droughts will be more frequent, occur in strange places, and last longer. Hurricanes will become more intense as the oceans warm. More frequent and unusual tornados will strike unexpected places. The weather is unpredictable even when it is normal. Build to withstand the harshest weather conditions you can imagine for your region. We will reach “peak oil” during the life span of homes built today. What than means is that all forms of energy will become increasingly expensive and with little forewarning by the powers that be. Natural gas is in greater demand just as it is starting to decline from existing wells in the U.S. How much will heating and cooling our homes cost in 5 years, 10, or 20? All we know is a lot more that it does today. 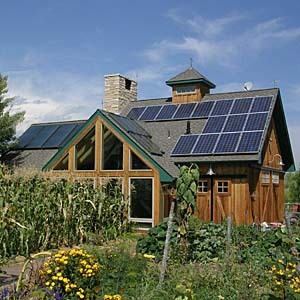 Roof-mounted solar panels are one way of reducing the consumption of fossil fuels and reducing the “carbon footprint” of a house. Fresh water will be one of the things that is most radically affected by climate change. When it rains and where will shift all over the globe. Snow pack in mountain areas that provide the water for agriculture in the summer may be hardest hit. 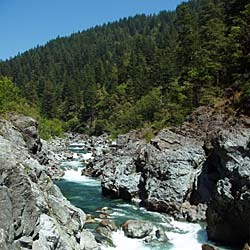 Less snow pack means less irrigation water, which affects food prices. Since globalization is so entrenched, particularly when it comes to food, when climates are impacted in Chile food prices go up in the U.S. Grains are particularly vulnerable to fluctuating water availability. China’s grain is irrigated with fossil water that is predicted to go away in as little as two years. Their demand for wheat will affect U.S. wheat prices. The price of corn is already rising as it is diverted away from food to produce ethanol. We are not growing old trees anymore. The ones that are still standing are the ones that anchor the forest ecologies of the world. At the current rate of deforestation and clear-cutting, our forests are destined for agriculture, even if that means replanting with mono-cultures of Douglas fir or eucalyptus. Our voracious appetite for wood, paper, and other forest products makes for a dire future for the planet’s forests (the lungs of the planet—our primary defense against climate change) and all the wildlife that lives within their protective canopies. If we don’t reverse this trend soon many of the plants and animals we take so for granted will only be seen in zoos and arboretums. Many Americans have taken clean water for granted, but increasing pressure is taking its toll. Aquifers once thought to be nearly limitless are dropping rapidly as a growing population competes for a finite resource. This story can go on and on. We are at a critical juncture in the history of humans on earth. With 40% of the world’s resources going into buildings, 66% of the electricity generated used for heating, cooling, and lighting buildings, the demand for new coal-burning power plants grows ever stronger. China is planning to build one coal-burning power plant a week for the next 20 years. There are 154 new coal-fired plants on the drawing boards in the U.S. in 42 states. There are currently about 600 coal plants in the U.S. that according to the Union of Concerned Scientists burn 1.4 million tons of coal each every year. It’s time to start planning, designing, and building homes that reduce the need for new coal-fired plants and help us prepared for the inevitability of more expensive power. Homes that produce as much energy as they consume and allow their owners to collect and store rainwater are things that we can do now. When energy changes from one form to another, some of it is lost. Take, for example, the energy potential in a lump of coal. Because of the different efficiencies of mining, transportation, and electrical generation, only 15 percent of its energy potential is actually delivered as usable power in a house. Illustration by: Martha Garstang Hill © 2008, The Taunton Press, Inc.
Let’s take it step by step with a summary of what builders can do to create the home of the future. Face the long axis of the house south. 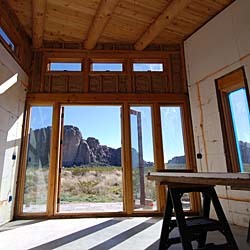 Size the windows for optimal passive solar gain. 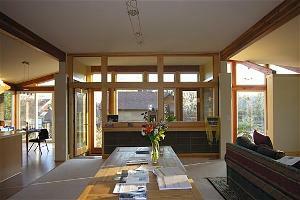 Size the thermal mass on the floor or illuminated walls relative to the glazed areas for a higher solar contribution. Provide enough south-facing roof area to accommodate current or future solar collectors. Plan early for landscaping that will help with shading the east and west windows in summer to reduce cooling loads. Houses that combine solar orientation, thermal mass to soak up heat, and the right number of south-facing windows can reduce heating costs substantially. Always consider any foundation material as part of the building system. From slabs to crawlspaces to basements, insulate them as well as possible on the exterior before backfill. Grade foundation drainage away from the house and backfill with gravel that will allow water to flow to the foundation drainage system to prevent hydrostatic pressure on the foundation wall. 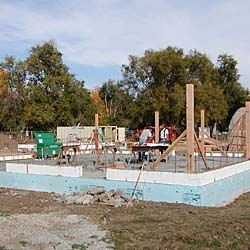 An insulated foundation becomes part of the house’s thermal envelope, contributing to energy conservation, and creating a more comfortable environment. Always use advanced framing techniques with FSC-certified lumber. In cold climates, frame walls for R-24 or higher insulation. 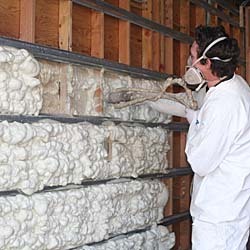 Insulation should reduce or eliminate the cavity effect by preventing air movement between the studs (structural insulated panels are one model of no-cavity effect). Place 1 in. of closed-cell rigid foam on the exterior of the sheathing to keep the dew point of the wall outside of the cavity. Install a drainage plane, and flash all penetrations and intersections perfectly to protect the building from moisture for its entire life span. 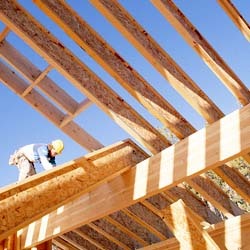 Substituting I-joists for wide dimensional lumber is a smart use of wood resources. I-joists provide equal or superior performance using less wood fiber and relieve pressure on remaining forests of big trees. Use the longest-lasting material you can afford that is designed for your climate. Make sure the entire roof assembly creates an air barrier from the living space below, which means no open areas around plumbing, ductwork chimneys. Insulate 50% higher than code requires. 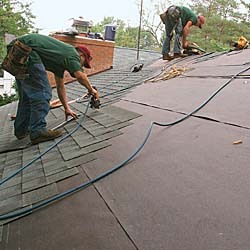 High-quality asphalt roofing shingles will last for many years and they perform well in regions where hail storms can damage other types of roofing materials. 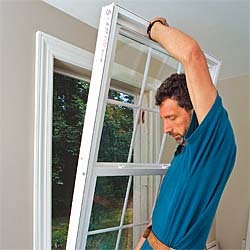 Install low-e windows as a minimum. Wherever possible install super glass in fixed-glass locations. Design for solar gain and reduce exposure to western summer sun. Casement windows usually have better air sealing and can be opened to catch breezes. Use windows with a solar heat gain factor of 0.33 or lower for east and west windows, especially in hot climates. Older windows with leaky weather stripping and single glass panes are good candidates for replacement. Optimize the design of the plumbing using a trunk and branch system. Reduce the size of supply lines to 3/8 in. to maximize flow and reduce heat loss. Install a sealed combustion water heater with an EF of 0.62 or higher. Insulate all hot water lines throughout the house. Install an on-demand hot water pump. Reduce flow rates at all fixtures and faucets below code. Conserve as much as possible. Use dual flush toilets. Pre-plumb for gray water segregation. Waterlines often run through chilly basements and crawlspaces before they deliver water to bathrooms and kitchens. Insulating all hot water supplies is a low-tech way of reducing energy losses. 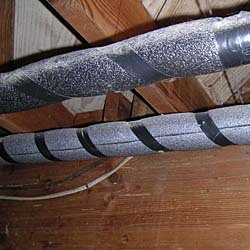 Insulating cold-water lines eliminates condensation. Install only high-efficiency sealed-combustion furnaces and boilers with efficiencies above 90% and air conditioners with 14 SEER or higher. Better yet, use evaporative cooling in dry climates. Make sure the mechanical equipment is sized properly to meet the dramatically reduced energy load of the house and no more. Provide for fresh air with mechanical ventilation. Keep equipment and all ductwork inside the insulated envelope. Reduce air pressure differentials throughout the house. Seal all ducts with mastic. Have the ducts tested. Consider geothermal heat pumps. In humid climates, a well-sealed and insulated house may require central dehumidification when temperatures are moderate but humidity high. 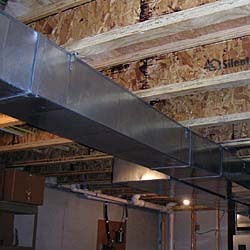 Sheet metal ducts are a good green choice. They are less likely to sag than flexible duct, don’t contribute any fibers or contaminants to indoor air, and are made from a recyclable material. Design daylighting to provide light to all rooms in daytime use. Design electric lighting carefully for the tasks and uses of each room. Use dimmers and occupancy sensors to minimize lighting requirements. Reduce electrical loads everywhere. Install compact fluorescent bulbs or LED fixtures wherever possible. Provide circuit switches to cut power to “always on” phantom loads. Install the most efficient appliances possible. (Energy Star isn’t always the minimum-load appliance). Well-planned windows can reduce electricity use. This sunny office space needs no artificial light during the day. More is always better. Insulate today to 50% above local code or DOE recommendations for your area. Make the thermal envelope continuous by eliminating thermal breaks or cold spots. Inspect for perfection of installation. Eliminate any air movement inside the wall cavities and through the building envelope. Create an uninterrupted building envelope with the insulation in contact with the air barrier. Keep the dew point outside the envelope by using exterior rigid foam. Use spray foam insulation between garage and all adjacent living spaces. Use spray foam or spray insulation on all band joists, preferably where any two materials meet. Conduct a blower door test. A well-sealed house, with proper ventilation, will maintain more comfortable humidity levels year round, reducing or eliminating the need for humidifiers in cold months and reducing the need for air conditioning in warm months. Metal channels attached to the inside of a conventionally framed wall allow a thicker layer of spray-in foam without increasing the depth of framing members. The practice also reduces thermal bridging. 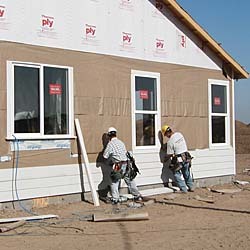 Use siding that is as long lasting as the intended life of the building. Cementious siding or real stucco is fire resistant as well as durable. Don’t use wood siding or decking unless it is FSC certified. Install recycled-content composite decking. Fiber cement has many green attributes and comes in panel form as well as planks that are applied horizontally. While it’s a little finicky to install, fiber cement holds paint well; is very durable; and resists fire, rot, and insects. Integrate solar hot water system with radiant heating systems. Provide ample space for hot water storage to meet the heating load requirements. 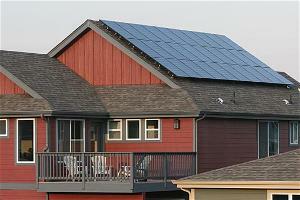 Install enough PV to meet at least 50% of the electrical load of the house. Install a battery back up system if you want protection for variable grid availability. Use feedback metering to tell you how much electricity you are using at any given moment. Look for net metering in your area that allows you to sell your “extra” electricity back to the local utility through the grid. This off-the-grid house uses photovoltaic panels to produce all of the electricity it needs. Grid-tied systems are more realistic for most homeowners. Eliminate as many synthetic materials from inside the envelope as possible. Be aware of the constituent chemicals in all surfaces and finishes. Use zero VOC paints and finishes. Seal formaldehyde-based products before installation. Eliminate solvent-based products from all adhesives and finishes. Provide adequate ventilation to every room. 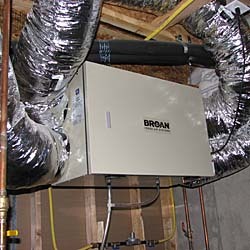 With forced air systems install MERV filters rated 6-12. Make sure that houses using forced-air systems have effective air sealing. Install a heat recovery ventilation unit. Having healthy air inside the house does carry an energy price tag. A way of mitigating the damage is with a heat recovery ventilator (or HRV), which can recover between 60% and 85% of the heat from exhaust air. One good use for this re-purposed energy is to heat water for domestic use with a ventilating heat-pump water heater. Install landscaping that is native to your location. Plant drought-tolerant species. Use landscaping to help reduce cooling loads, especially around east- and west-facing windows. Plant edible landscaping for people as well as birds, butterflies ,and wildlife. Install a water catchment system based on your annual rainfall. A meeting involving builder, architect, owner, and trade subcontractors may seem foreign to some builders but it’s an excellent way of ensuring that everyone is on the same page. Strategy sessions may also help to cut costs. The only way to prepare for the future is to bring our focus home, literally and collectively. Cities across the country are leading the charge to become Kyoto compliant. In many cases that means reducing their carbon dioxide production by 25% or more. Some cities, such as Portland, Oregon, have already achieved their goals. But a city is merely a collection of families. If each family takes responsibility for its consumption patterns, its carbon production, and shopping locally, we can make a huge difference. We want to keep our sales tax dollars in our communities. Especially around energy. When we fill our gas tanks it is taxed once and all the profit leaves the community and typically the state. The profits end up in Saudi Arabia, Houston, or Washington, DC. That doesn’t help pay for firemen, policemen, teachers, and the folks who run our communities. If we keep our dollars local, by not buying fossil fuels, the money saved provides local jobs. It can go toward movies, dinner, clothes, and books from companies that pay local sales tax. Those savings are cycled three to eight times before they leave the community. What that means is the city collects three to eight times as much sales tax when energy is saved than when it leaves the community to oil and gas companies. In the past it was common practice to build to code and let the government tell us how and what kind of homes we should have. From this point on it is imperative that we determine what the standards should be for our communities. Through LEED and the NAHB green building guidelines the building industry is leading the transition to a more sustainable future. It takes every one of us to lead in our own communities. Your customers are waiting for you to provide the kind of energy-efficient and environmentally appropriate homes that they want. Take a step forward and see if your market responds. 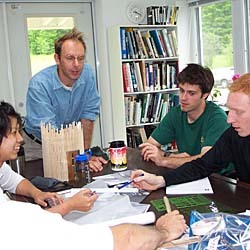 Join a local green building program. Start one if there isn’t one. See the book's Resources for help in learning more about green building guidelines. All of this may be seem overwhelming but each step is a basis for creating homes that are self-reliant, resilient, and versatile. The scale of environmental changes facing us is enormous and unpredictable. It is only common sense to begin making our homes right for the world we really live in. Future-proofing your home is one of the smartest investments you can make today for your customers and your company. Finish Werks Builds Green Modular Homes, Prefab Green Homes, and Energy Star Home Certified Modulars.